I have had several diabetics tell me they don’t eat beans because they are carbs. I have controlled my diabetes for almost twelve years by eating beans almost daily. That is the only piece of advice the nutritionist gave me that has actually worked for me. Yes, beans are carbs but they are good carbs. Not all carbs are created equal! 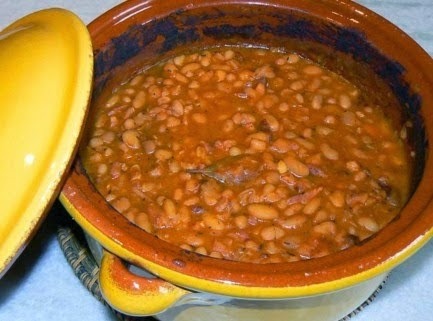 If you don’t eat beans, just pass up the recipe. This is not a KETO or low carb blog. I don’t follow either program and I have very well controlled diabetes and have never taken insulin. And remember, with any food quantity counts. I suggest a 1/3 to 1/2 cup serving of this recipe with a protein item. Melt butter in a large skillet; add apples and cook until tender. Stir in the Splenda products and cook until melted. Add the ketchup and cinnamon. Add the two types of beans and the bay leaf-if using, mixing well. Pour the mixture into a slow cooker or crock-pot. Place lid on cooker and cook on high 2 to 4 hours.